We are saddened to report the passing of Howard Shatto on January 21, 2018. Known as the father of Dynamic Positioning, Howard Shatto’s contributions to the offshore oil and gas industry, and the marine industry as a whole, go well beyond DP. A Yale graduate, he began his career with Shell where he was immediately tasked with building Shell’s first diesel electric drilling rig. Deployed two miles offshore it drilled Shell’s first offshore wells. This was just the beginning of the numerous innovations Howard pioneered in dynamic positioning, remotely-operated vehicles (ROVs) and offshore technology. Howard led in the development of ROVs for intervention on the first subsea BOPs for drilling and production, He conceived the world’s first automatic control for DP on Shell’s Eureka core drillship in 1960, and in 1970 he made industry history with the Sedco-445, the world’s first DP oil exploration riser-equipped drillship. Since then over 4000 DP systems have been built worldwide using Howard’s initial concepts. As an innovator, the fact that many of his ideas were initially met with skepticism did not deter him. A holder of 35 US patents, his “firsts” are only matched by the number of awards bestowed on him. These include the Offshore Technology Conference Distinguished Achievement Award in 2001, the Dynamic Positioning Committee’s Life Achievement Award, the Blakely Smith Medal in 2007 and many others. Howard served on numerous committees, including the MTS Dynamic Positioning Committee, and the Technical Advisory Panel of the multi-national Ocean Drilling Program for Earth Sciences. 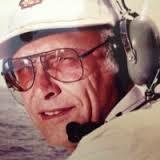 He was inducted into the Offshore Energy Center Hall of Fame in 2000. He authored papers that were presented at OTC, SNAME, the World Petroleum Congress and DP Conferences, and he wrote the Ocean Engineering Handbook’s chapter on ROVs. Even as he grew older, Howard’s passion for improving DP reliability and sharing of knowledge did not falter. He attended every MTS Dynamic Positioning Conference, engaging with attendees, participating in discussions and inspiring respect. While we mourn his passing, his motto “There’s always more to be done” will long stand as an inspiration to the industry he helped shape – and loved – and to those who follow in his footsteps. My deepest condolence to Howard and his surviving family. Heartfelt condolences to “The Father of Dynamic Positioning” Rest in peace sir… your presence will always be felt when we talk about DP! !